The CloudSponge Contact Importer is a Heroku add-on to import address books from Gmail, Yahoo, Outlook.com, iCloud, AOL, LinkedIn, Outlook desktop, Mac OS X Address Book and many others. You can use these email addresses to invite Friends, find Friends, or whatever other application you need. You can see it in action on our test drive page. Additionally, our HTML widget importer can easily be plugged into your website in less than 5 minutes, just using a simple copy/paste. Later, you can replace our branding with your own company name in addition to several other customization options. You can even use one of supported APIs to take full control of the importer process. Once it has been provisioned, a CLOUDSPONGE_KEY setting will be available in the app configuration and will contain your Account Key. This can be confirmed using the heroku config:get command. After installing CloudSponge, the application should be configured to fully integrate with the add-on. Because your CLOUDSPONGE_KEY is generated asynchronously after the add-on has been provisioned, there will be a short delay before it is available. If you get an empty value for CLOUDSPONGE_KEY, wait a moment and try again. At Heroku, the config var CLOUDSPONGE_KEY is now automatically filled after install. In this sample, our CLOUDSPONGE_KEY is 1234. 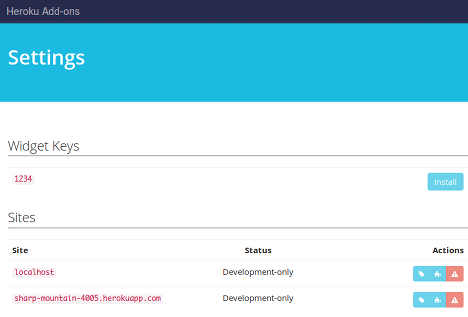 If you need a different way to setup your local config vars, visit the Heroku Local article. Now it’s time to setup your importer. Our Contact Importer Widget is appropriate for developers who want to get up and running quickly. You can see it in action on our test drive page. The user experience is fully customizable to suit your needs. The CloudSponge widget’s look and behavior can be customized in many ways to blend in with your application. Read more about our current widget customizations in our documentation. The user experience can also be white-labeled so that your users don’t see the CloudSponge brand anywhere. You can read more about this advanced topic on our online documentation. Our server API eases the burden of maintaining multiple provider integrations while giving you full control over every pixel of the user experince. The CloudSponge Contact Importer dashboard allows you to manage your sites, manage users and check address books import statistics. or by visiting the Heroku Dashboard and selecting the application in question. Select CloudSponge Contact Importer from the Add-ons menu. If you Heroku app has a top level domain, like example.com, you’re not required to do any changes to your code. Once you test the widget in your new domain, it’ll be automatically recognized and added to your domain list. The CloudSponge Contact Importer can be removed via the CLI. Heroku support should be sent via Heroku Support channels. CloudSponge Contact Importer related issues or product feedback is welcome at support@cloudsponge.com.